Are you looking for guidance and counseling? With over 40 years experience, and her holistic, spiritual, intuitive understandings, Ruth Drayer is a trustworthy guide. Internationally known, Drayer carries forward the line of numerologists begun with the Greek mathematician Pythagoras, the Father of Numerology, and passed into our times by Dr. Juno Jordan. The ancient science of Numerology has much to offer. Through it, your full name and birthday construct your Divine Code which explains your life plan. By knowing your plan and purpose, potentials and personal cycles, you are empowered to make more confident choices in enhancing or restructuring your life. With her high degree of accuracy, Drayer assists you to see your life in a new light. 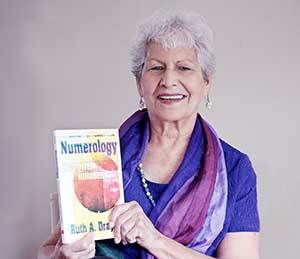 A reading with Ruth is a giant step towards creating a satisfying future. Ruth works by telephone and records your session so that you can hear it as many times as you like. Numerology is the art and science of interpreting how numbers influence our lives and destinies. Numerology classes by conference call, personal mandala art, personal numerology readings and more. "Ms. Ruth, You changed my life PERIOD! You taught me so much about myself, so many life lessons and..."